The SPI-200 is a master SPI controller. It was originally designed for use with the Rabbit Semiconductor Rabbit 2000/3000 chips and modules. The Rabbit processor has poor syncronous serial ports. They are slow and require a considerable amount of code to support. They do not support MSB-first transmission so all the data has to be reversed before transmitting and after receive. 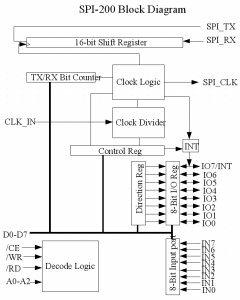 SPI clock modes are difficult to support. Programmable Transmit Length from 1 to 31 bits. 8-bit Input or Output port, each pin has programmable direction. 3.3V power, 5V tolerant I/O. Small PLCC-44 or PQFP-44 package. Programmable clock divider From CLK_IN/2 to CK_IN/256. I/O interface compatible with most processors. The SPI-200 is designed to support any SPI device. The programmable clock polarity and in/out clock edge options allow any SPI mode to be implemented. The chip can be added to the data bus or Aux I/O bus of almost any Rabbit module. It will work on most any processor with a data bus. The interface is a standard /Chip enable, /Read and /Write lines. The 8-bit I/O port can be used for chip selects or general I/O. There is also an 8-bit input port. One of the IO pins can be programmed as an interrupt output. The chip has been tested and is working properly. Libraries for the Rabbit processor are in development. A demo board is also planned. The chip has achieved burst data trasmission of well over 1.5MBytes/sec at 33mbit/sec.. The limiting factor is the speed of the rabbit processor.